My good friend and I’ve worked together on a game modification many years ago and helpe out each other on models and textures all the time. Next to that we privately chat quite alot and of course we always did each other some favors. For his graduation work he had to equip his simulation with a 3D Model visualization and asked me for help on that. I knew this would be something quite new for me and it probably leads me to the limits of my 3D-skills and my computer’s specs. Though knowing that, I couldn’t let him down and so we began. Compared to all other 3D-models I’ve ever made, I never a time limit such as five weeks in this case. 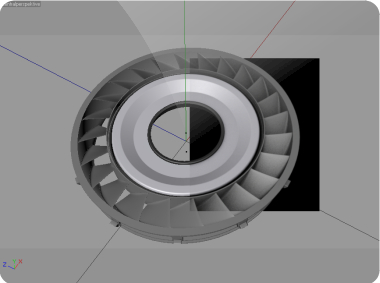 The first test models were made, the HP-disk went quite well and so I continued on the twisted impeller. After three components were finished, the news arrived that the dead-line has been preponed by two weeks. Now we had to put our noses to the grindstone. One component got finished after another and still it felt like never ending work. The photos got “meassured” and drawn into CAD. Depending on the component, a cut view or the top view has been of advantage. Because of meassurement variances caused by different perspectives and lens distortions on those reference images, I had to define average meassurements. 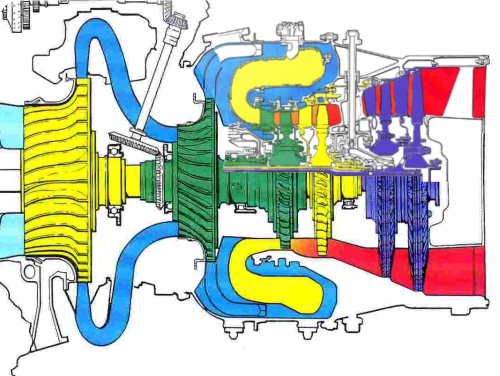 Some parts even had no clear defined dimensions why I had to drawa cut view of the engine. That drawing gave me the oportunity to scale and position all parts to their best possible result. In fact it has worked out quite well. 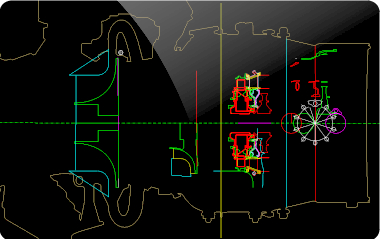 All components fit well to each other, all channels were in perfect alignement with the shovels and there are no mesh colissions at all. It has been a great experience for me. 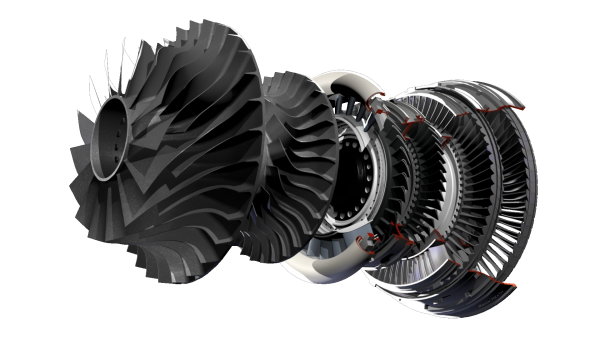 Till that time I knew not much about turbine technology and so my friend explained me a bit about it. Even if I’m at the airport, I see those turbines in a different way now. 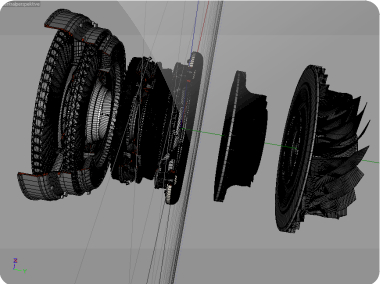 The project sometimes almost made me mad and with those impellers I didn’t know how to start on that twisted geometry, wich is still very simplified right now. And then don’t forget the time limit. Three weeks are quite okay but during that time I had to prepare for my exams (all passed) and busy work. So it happened that I worked into the night for a few hours just to get the job done. The simulation is complete, my friend passed his presentation well, the examiner were totally astonished by the detailed visualization, wich kinda is an indirect praise to me. Of course I don’t expect cash from my friend for that work but he owes me a favor now. And in the end the classic saying applies that I have gained some knowledge and skills again.